Professor Devlin was born and raised in upstate New York. Before law school, he worked as a biomedical laboratory assistant, in summer stock theatre, and in national political campaigns, among other jobs. After law school, he clerked for Hon. Eugene Nickerson (E.D.N.Y) and was an associate with the NYC law firm of Kornstein, Veisz & Wexler — a small firm, specializing in commercial litigation. 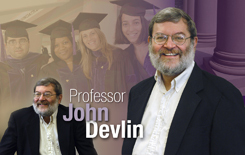 Professor Devlin joined the LSU faculty in 1986. At the LSU Law Center, he has taught primarily in the fields of constitutional law (federal, state, and comparative); federal civil procedure, administrative law, and employment law. He devotes a significant amount of time working with student organizations (e.g., as advisor to the Law Review, the Moot Court Board and, most recently, the new Public Interest Law Society). In addition, he coached the Law Center National Moot Court team and several other interschool moot court teams. Early writings focused on state constitutional law. John Devlin, Louisiana Associated General Contractors: A Case Study in the Failure of a State Equality Guarantee to Further the Transformative Vision of Civil Rights, 63 La. L. Rev. 887 (2003). John Devlin, Genetics and Justice: An Indigent Defendant's Right to DNA Expert Assistance, 1998 U. Chi. Legal F. 395 (1998). John Devlin, Louisiana Constitutional Law, 54 La. L. Rev. 683 (1993). John Devlin, Louisiana Constitutional Law, 52 La. L. Rev. 575 (1991). John Devlin, Constructing an Alternative to State Action as a Limit on State, 21 Rutgers L. Rev. 819 (1990). John Devlin, Louisiana Constitutional Law, 51 La. L. Rev. 295 (1990). John Devlin, Privacy and Abortion Rights under the Louisiana State Constitution: Could Roe v. Wade Be Alive and Well in the Bayou State, 51 La. L. Rev. 685 (1990). John Devlin, Louisiana Constitutional Law, 49 La. L. Rev. 395 (1988). John Devlin, Louisiana Constitutional Law, 48 La. L. Rev. 335 (1987). John Devlin, State and Local Government, 34 S. C. L. Rev. 203 (1982).